Two years ago, I made my first ever chocolate mincemeat, it was a great success. 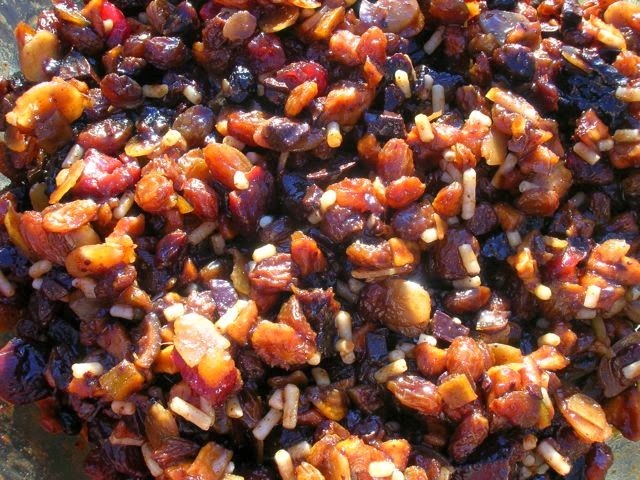 Last year, I improved the recipe by adding chilli and prunes and and made Chilli and Chocolate Mincemeat. This year I did something different again, although I retained those three ingredients as they have now become integral to my recipe. Basically, it’s a question of using up whatever dried fruit I have lying around in my kitchen cupboards. I happened to have a lot of sultanas and also a bag of mixed berries, but no currents and not many raisins. Some marinade and some don’t. I’m in the former category and have mine steeping for five days before placing into jars. Who needs air fresheners when you have a bowl of fruit marinading in alcohol and spices? The house was nicely fragranced for several days. So in time for Stir-up-Sunday, the last Sunday before Advent, I had all of my ingredients ready for their final stir. This auspicious day is traditionally when the Christmas puddings are made and families gather to have a stir and make a wish. I wasn’t making Christmas puddings, but we gave a good stir and made a wish anyway, then jarred them up. Very fortuitously, I’d been sent a range of jars and bottles in varying sizes from Pattesons Glass, including one of my favourites, a clip top jar. So I had some brand new shiny jars to use for my mincemeat – perfect for gifts. Being a great preserver, I’m looking forward to using the rest of the glassware. Sadly I didn’t manage to make sloe gin this year, but I will find something delicious to put in those lovely clip top bottles. And the sauce bottles are just what I need for my chilli sauce – assuming our chillies ever ripen enough to make any this year. Pattesons sell all sorts of glass jars and bottles including some unusual designs and Le Parfait. Most, however, are only available as a bulk order, so you may need to make some room on those pantry shelves or alternatively share them around with other preservers. I hate to see waste, so I had to lick the bowl out. This also provided an opportunity for quality control and I can confirm that this chocolate chilli mincemeat is once again delicious. A recipe for mincemeat that can easily be adapted to suit varying tastes and what is available in the cupboard. The chilli and chocolate take homemade mincemeat up a level, giving extra depth and spice, without either being easily identifyable. 400g cooking apples (I used unidentified Cornish varieties) - peeled, cored and finely chopped. 1 small rocoto chilli - deseeded and chopped finely. Place all of the ingredients into a glass bowl and give a good stir. Cover and leave to marinade for five days, stirring on a daily basis. Spoon into sterilised jars, cover with waxed paper discs and store in a cool dark place until ready to use or giveaway. Best made a few weeks before Christmas and if stored well, should easily last a year. Makes enough to fill 3 half litre jars. With the predominance of sultanas in this mincemeat, I am submitting it to One Ingredient where the theme is Fruits of the Vine. Hosted by Nazima of Franglais Kitchen and Laura of How to Cook Good Food, this is a monthly challenge. A jar of this is also winging its way over to Javelin Warrior for his Made with Love Mondays. Thanks to Pattesons Glass for sending me a fabulous selection of their ware. I was not paid for this post and all opinions are my own. 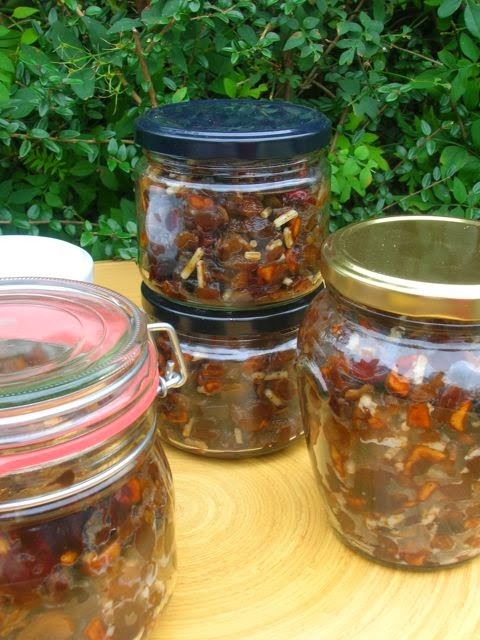 I love mincemeat, just perfect for this period of the year! Gorgeous set of ingredients in this one, really like the idea of dried blueberries. I made my Christmas cake on Stir Up Sunday but will be mincemeat-ing at the weekend and will definitely be using this as inspiration. god this looks so good… can’t wait for the mince pies!!!! love the addition of prunes too! You have made the proper stuff. I need a tip or two from you as I have never made my own mincemeat. This is superb though! And here I was wondering if I would make fruit mince this year – I love mince tarts but always have mince over and this year still have a bit of last year’s mince in the fridge – but seeing this does make me want to make some. I was surprised that you don’t cook yours at all, especially with the apple in it. Does it all change texture after sitting for a few weeks or can you use it straight away if you want to? A very delicious collection of ingredients, great bonus that it makes an air freshener too 🙂 P.S. I’ve posted that brownie recipe!